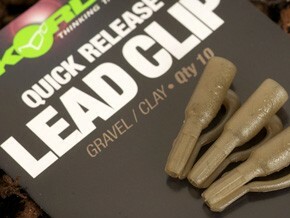 These new lead clips have been designed to smoothly eject the lead in snaggy or weedy conditions. The lead-retaining arm is smoothly configured to allow for seamless ejection and the body features specially engineered grooves that prevent the tail rubber from adhering to the tail of the clip, ensuring a smooth lead drop when you need it most. The clips are of robust construction, so they’ll deal with the most brutal casting with big leads and they’re available in weed/silt and gravel/clay colours.